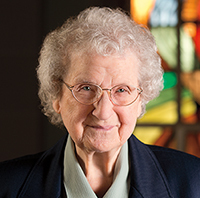 Sister Ann made her first profession at age 20 and started teaching shortly thereafter. “I had 40 students in four grades,” she recalls. “It was only by the grace of God I got through that year.” Sister Ann went on to teach for 50 years, primarily at the high school level. Along the way, she obtained undergraduate and advanced degrees in history. At age 66, she traveled to Helsinki, Finland, to teach at The English School, which was founded by her community, and greatly enjoyed interacting with students from many different cultures and backgrounds.